Cameron Carpenter, an organist of prodigious technique and an immensely creative bent played throughout a compelling BSO program under the direction of guest conductor Bramwell Tovey on Thursday evening. Carpenter presents proudly as a maverick of the “classical music” stage. Sporting a Mohawk, he cut a lively and glittery figure in the embrace of the curvaceous Symphony Hall Skinner organ, with its console at center stage. His hands and feet flew across the key and pedal boards and stop jambs. Those feet, incidentally, were shod in black leather with a plethora of sparkling rhinestones bedecking each heel. And, why not? The man stands every inch a showman, and he possesses the facility to play virtually anything with panache and virtuosity. While clearly his own man, there is no denying that the has inherited the platform style of another great organ showman, Virgil Fox. Indeed, Cameron may well be Fox incarnate. The opener, Samuel Barber’s Toccata Festiva, op. 36, commissioned for the Philadelphia Orchestra to inaugurate its 1960 Academy of Music Aeolian-Skinner instrument, bears it age quite well. Much of what is remembered fondly of Barber is present in this showpiece for organ and orchestra: bold, thrusting themes contrasted with romantically elegiac, longline melodies, all handsomely scored. I remember being mightily impressed with an LP of this music recorded by Eugene Ormandy and E. Power Biggs for Columbia, a disk I nearly wore out from so many listens. I still have it, and hearing Tovey and Carpenter play it stirred many fond memories. 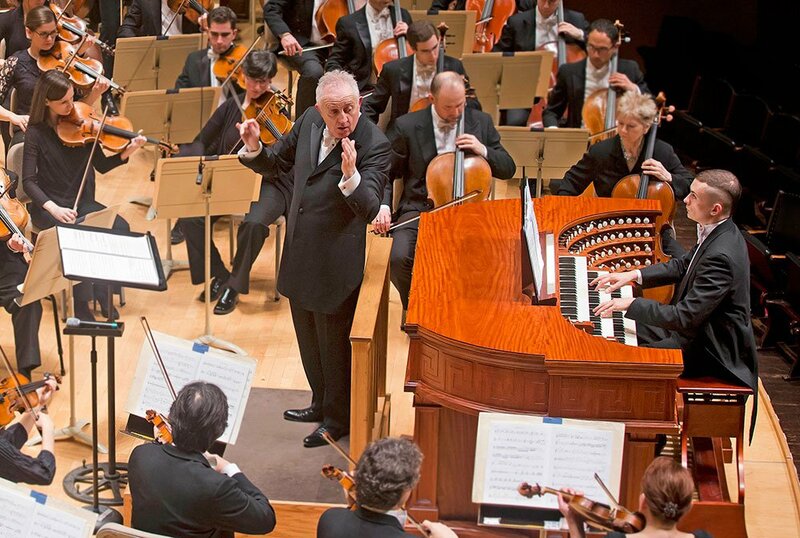 While perhaps not quite so incisive, this BSO performance felt well integrated and extremely effective. In the extended pedal solo, not only did we hear the beat of those dancing feet, but we heard musical expression from the most rapid and elaborate flicking of individual stop knobs that we have ever witnessed. Overall, we enjoyed the mighty sound of a modern symphony orchestra and organ joining forces. Whoops and hollers permeated the applause. Was a Carpenter claque in the house? Before moving on, Tovey made engaging conversation with the audience to prepare them for what they were about to hear: the 30-minute, three-movement At The Royal Majestic, Concerto for Organ and Orchestra (2014) by American composer Terry Riley. At Tovey’s first mention of the composer’s name, more cheers and applause emanated. It would appear that a sizable Terry Riley fan club was also present. Tovey then gamely and charmingly expanded upon Robert Kirzinger’s excellent and comprehensive printed essay. Tovey also pointed out the interesting instrumentation of the music: no fewer than five bassoons plus a contra bassoon and two bass clarinets at the low end, three piccolos and an alto saxophone at the high end, a huge battery of percussion: five players playing fifteen groups of instruments—four trumpets plus flugelhorn, no oboes or English horn. The organ, he explained, would fill in much of the middle. Then, we dashed off to the Riley races. The composer’s valuable notes about his composition appeared alongside of Kirzinger’s observations mentioned above. In essence, Riley is a compiler of sonorities and an orderer of fragments. Some describe this music as “minimalist,” and while other of his output is indeed so styled, I found something different afoot in this new concerto. The “motoric” element of traditional minimalism was largely absent, and Riley’s aim seems to be of the offering of a myriad of short, cannily scored bits and pieces of melody and sonority, the result of which could be compared in a visual sense as parallel to a very complex and colorful patchwork quilt. I was intrigued for most of the time by the music’s craft and unique play of sound, also of the organ’s almost constant contributions to its overall presentation. And I watched and listened with fascination as percussionists Kyle Brightwell, Daniel Bauch, and Matthew McKay were kept very busy as they rapidly moved balletically from one instrument to another. Yet I must admit that my interest slackened after 15 or so minutes of this, with no dramatic arc or audible emotional objective part of the mix. I was surely impressed with what I heard—this music has a unique sound and spirit—but ultimately I was not moved. I’m going to give it another chance by attending Saturday’s performance, to hear what I perhaps missed on Thursday. If ever a piece demands a second hearing, this is one. The audience’s very positive response led to Tovey’s insisting that Carpenter play an encore, and that he did: his transcription of the joyful Gigue from J. S. Bach’s French Suite No. 5, much of which he played on the pedals. This so delighted the crowd that it demanded another encore, and Carpenter enthusiastically complied with his amazing arrangement of Bart Howard’s “Fly Me To The Moon,” and to the moon it went. Perhaps no other organist has revealed more creative sonorities of the Symphony Hall organ in so short a space. Carpenter’s ingenious registrations transformed this venerable concert instrument into a colorful theater organ, a “Mighty Wurlitzer” if you will. Again, his remarkable technique astonished in its clarity, facility and rapidity and variety of touch. And not only was the audience entertained, broad smiles beamed among the orchestra members. They recognized a true virtuoso at work. After intermission, Tovey directed a beautiful take on Edward Elgar’s sublime Enigma Variations, op. 36 (1899) that recalled the stunning revelations that Colin Davis disclosed in his performances with the BSO many years ago. The orchestra brought nobility and generous emotion with particularly beautiful solo contributions from Martha Babcock, Acting Principal Cello; Steven Ansell, Principal Viola; and William Hudgins, Principal Clarinet. The entire brass section sounded glorious, and there, at the organ console, now moved to stage right, presided Cameron Carpenter. If you decide to attend Saturday’s concert, I’m sure you‘ll be glad to have heard this unique program. BMInt‘s amusing interview with Carpenter is here. There were clip-clop moments Friday in the Riley that sounded like Ferde Grofé on LSD. Kind of geezer jazzy overall. Nice match of talent and composer. There is no t in Robert Kirzinger’s last name. I mention it here rather than in an e-mail to the publisher because Mr. Ehrlich’s insertion of it mirrors a common error in pronunciation: many people pronounce it the way Mr. Ehrlich spelled it — they give the z a German pronunciation. But Mr. Kirzinger pronounces it without the t sound. Ron Della Chiesa has finally learned to say it correctly; so should we all. I was there on Thursday. Riley’s name will probably never replace the one currently at the top of the Symphony Hall proscenium, but his piece was enjoyable to listen to, and Mr. Carpenter was fascinating to watch. I’d say the same about the Barber. Mr Ehrlich is fortunate to be able to attend again on Saturday. I’ll be listening on the radio, and I wonder how much the lack of the visual element will reduce the experience. Darn! I missed the clip-clops. I’ll have to try again on the 23rd. As for clique-claques, given the many empty seats in the balconies on Thursday, If there were claqueurs, it’s a good thing — and too bad there weren’t more. I hope the reviews attracted a larger audience for Saturday. I can also say that listening on the radio and thereby losing the visual element didn’t diminish the enjoyment of the music. Perhaps the value of seeing the performers is directly proportional to the hearer’s familiarity with the music. If you’ve never heard it before, it’s better to just listen and not be distracted by trying to see who’s playing what; but once you know the music, the visuals heighten the experience. A second hearing of Thursday’s concert on Saturday paid welcome dividends. Riley’s Concerto sounded more coherent to me, and Tovey conducted the orchestra with greater assurance and showing of nuance. I listened for and heard the “Dies Irae” fragment – the first several notes of the famous chant are heard repeatedly in first several minutes of the third movement. Thanks for pointing that out, Mr. Whipple. I also more fully appreciated Riley’s debt to Charles Ives. The beautiful ending of the second movement was almost pure Ives. There was also more “motoric” churning evident to me this time, as well – the ending of the first movement is full of that. Camron Carpenter was, if anything, even more impressive on Saturday. Once again he unfurled both the Bach and Howard encores from Thursday. A colleague reported that Carpenter played “You’re a Grand Old Flag” in place of “Fly Me to the Moon” on Friday afternoon. While I enjoy that flag-waving piece of musical Americana, I was really pleased to hear Carpenter once again launch “Fly Me to the Moon” into the heavens one more time. It was even better than Thursday, and that’s saying something. Does anybody know why Bramwell Tover called the Riley piece “At the Grand Majestic,” rather than “At the Royal Majestic,” as it was named in all materials from the BSO? He did it on Thursday and again on Saturday. Does he reserve “royal” for things actually connected with a monarchy?